All I wanted was to sing. To scream and shout. But alas the doors on the house asked me to remain inside. And inside was a life not conducive to these dreams. There was a man whom we called ‘abba’ and a woman whom he called just about anything. There were a few others who I don’t want to remember but their screams at night always haunt me. I was fifteen when I walked out of that house and decided to never return. There was pain on the faces of those many who saw me walking out. But whether that pain was for the loss of a loved one or the emotion of being a have-not, I do not know. And never once did I go back to find out. “This is the house I was talking about,” the voice snapped me back again. I looked around. A room filled with people. Looking expectantly at me. Waiting for the memories in my head to subside. I gazed at the projector again. The door. The very one I walked out of. “How much are they asking?” I asked, in that sharp tone which lacked all conviction of clarity presently. “Apparently nothing. It has been abandoned after the family disappeared overnight a few years ago,” the man in black suit replied. The man I often sleep with in this very room in my free time. My fingers began to tap the desk invariably. An act of nervousness very rarely revealed. “Let’s have a look at it tomorrow,” and with that walked out of another room. Another four walls and one door reeking of falsity. It has been abandoned after the family disappeared overnight a few years ago. What did he mean by saying abandoned? And how few is he talking about? Where was I when this happened? Is fifteen years few? “Can you get me on the next flight to Port Blair please?” the lady on the other side could barely make out the sweat on my brow. But perhaps she did seek the nervousness in my voice at two a.m.
“Seven am mam. And your flight is booked,” the freshness of her voice built such a strange contrast to my thoughts in head. It was probably long over due. The visit should have come about earlier. I stood there in front of the house as if it was the mecca of my life. Dwarfed by its four story-ed height and belittled by ancient worn-out walls looking stifled with all those stories. I took a few steps ahead when an old woman stopped me in my tracks. “Kidhar ko?” she asked in a shrill voice. I pointed at the house and simply said,” The family. Where?” My gestures spoke more than the words I emanated. “Koi nahi,” she replied gruffly. And turned around to walk the other way. Leaving me almost stranded in the middle of the street. “Ma’am, may I help you?” and in no time did this bright young man come up to me. “We are looking to buy this property. Could you tell me some history on the family that was living here?” I asked pushing my well worn Ray-bans slightly more up my head. “Ma’am they say their middle child ran out on them on a rainy night. Leaving behind a trail of destruction. Every night there was one escape and the next morning a dead body. They say the runaways were hunted by the father and killed. Until all that remained was the odd couple. Mother and father. And then one day they discovered that the father had been dead for weeks. No sign of mother anywhere,” he completed expecting to be rewarded for his ready information to the outsider. I didn’t quite know what to say. The tears in my eyes were beginning to well beyond their boundaries. I pushed a fifty rupee note in the hands of the boy and started to walk towards the house again. “Ma’am do you know what they call this house?” he shouted from behind. I didn’t quite turn but stopped in my steps to acknowledge the address. “They call it happy days. Each one of them wrote just one line in the note they left behind. ‘Going to find happy days’,” his words brought an avalanche of emotions in my mind. An illegible note crumpled in the hands of a fifteen year old came back to my eyes. And the shaking hands which placed it on the bedside on her mother. I looked at the old woman squatting underneath the tree on side. I didn’t have the courage to tell her. I didn’t have the strength to own up. I didn’t have the capacity of the act she finally pulled through. I left her alone with her memories. “Ma’am the purchase has come through. What would you like to call the hotel?” he asked. This week’s Blogchatter prompt is happy days. Write a post on the theme, be ir fiction, poetry, inspirational or anything that tickles your writing muse and connect with us this week. 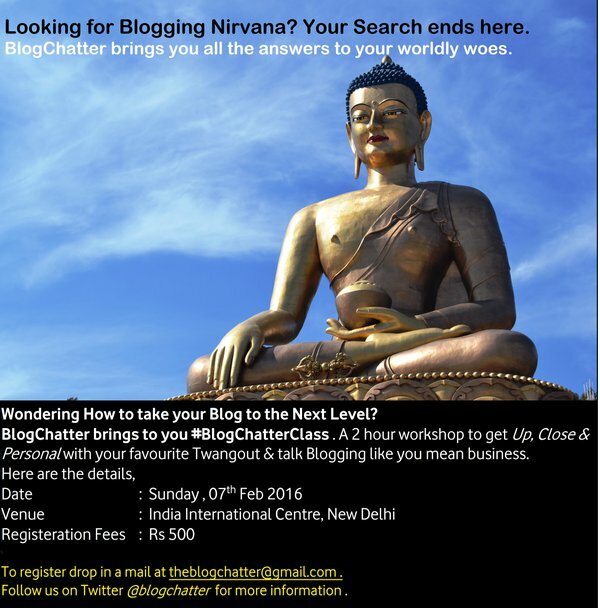 Blogchatter is a community of bloggers where we are blogging together through day and night. 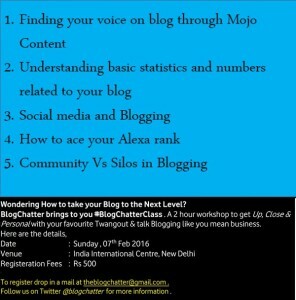 Sharing fun, conversations and much more over cups of blogging and chai time chit-chat. Every Wednesday though at 8.30 PM IST we bring the party to town for an hour over a chat session. Join us! 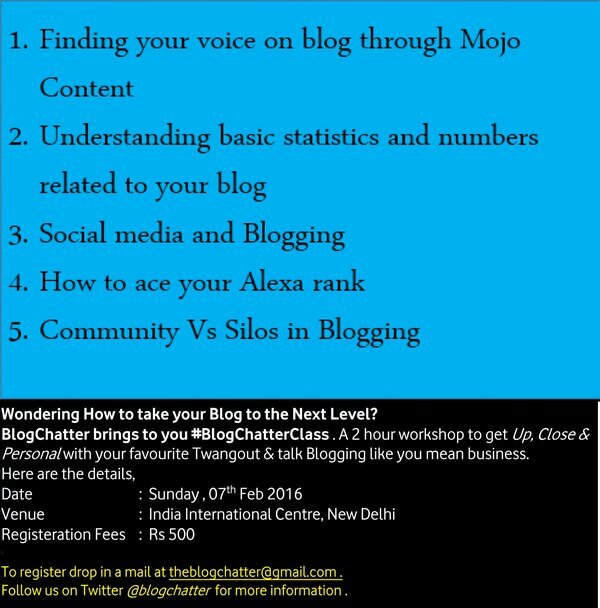 Also we are embarking on a country wide tour with Blogchatter classes. And our first stop is Delhi! You can Buy tickets here. This story gives me the creeps – well written. I feel for the people who will stay in that hotel – will they be haunted by the children who escaped to find happy days, but were killed by their abuser? Such a sad tale of loss. The old woman is her mother, right? Quite a story.. with every line revealing something new. Creepy story but interesting…..Got me hooked till the end. I am so happy to see a fiction from you! The story was intriguing. She must have been devastated learning what became of the family when she left to find her Happy days…life is filled with such ironies. Intriguing tale. Kept me hooked till the end. Happy days! Just a Wow…. Such profundity ! That’s deep and nicely written. That got quite creepy towards the end. Brilliantly done :D.